There are no bedside cabinets in our van. We wanted somewhere to hold water bottles, flashlights, our phones while they charge, and so on. 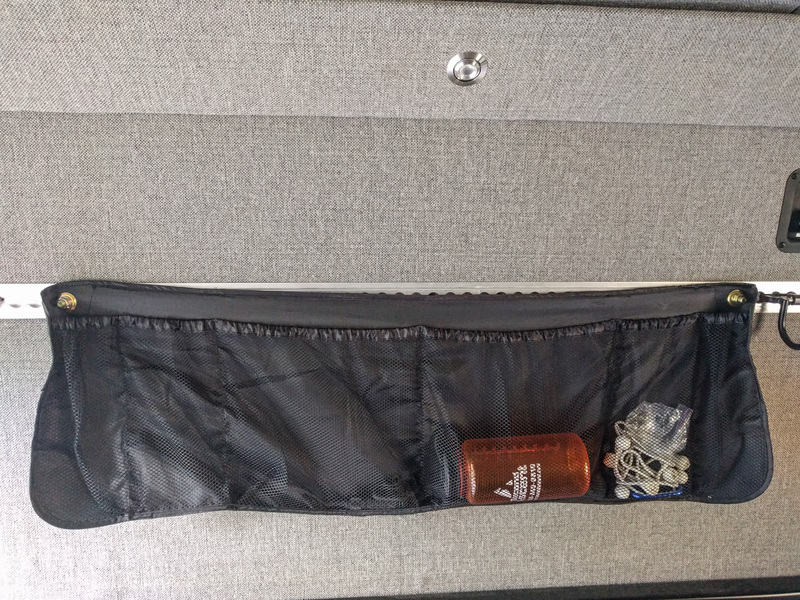 Adding grommets to cheap car trunk organizers solved the problem. 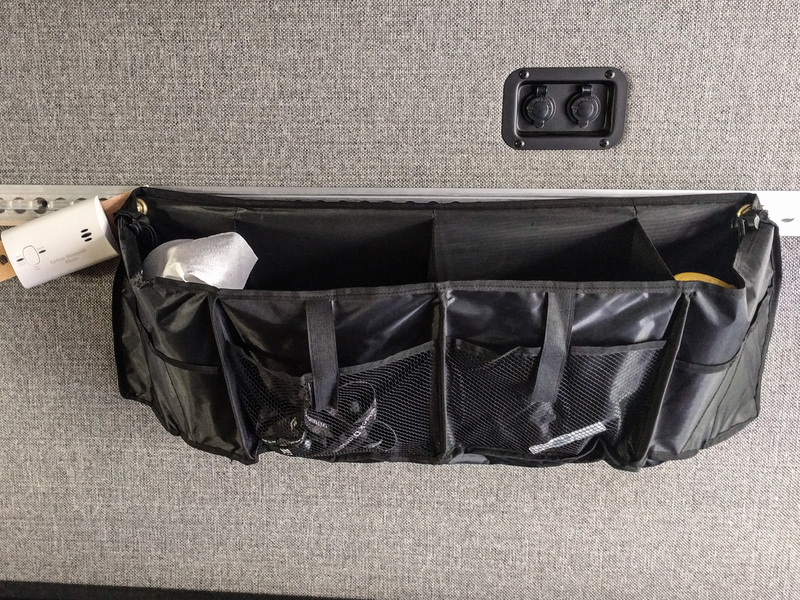 We bought two styles of car trunk organizer from Amazon. One has quite large pockets and a smaller mesh front and cost $8. The other has full height mesh pockets and cost $12. Big spenders, aren’t we! 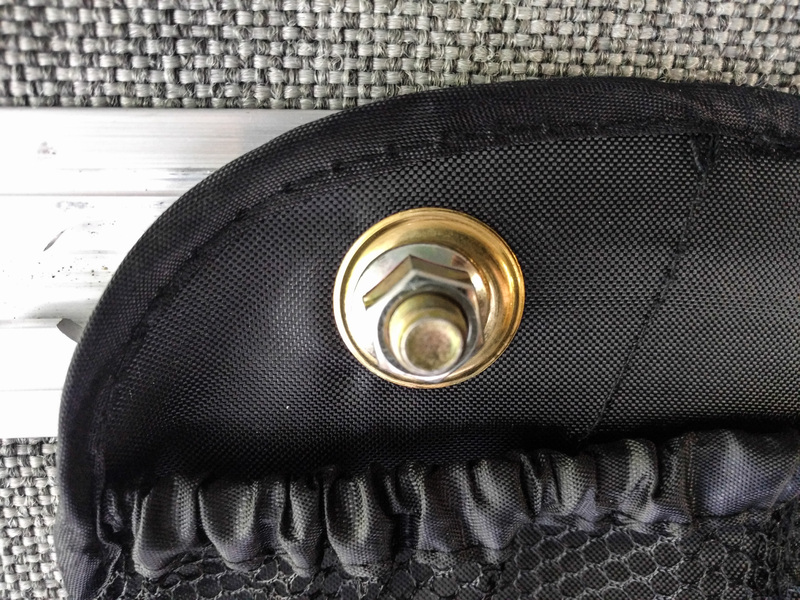 To mount them in the van, we added two brass grommets to each organizer, in the top corners, and then hooked those grommets over stud fittings in the l-track. In the top photo, you can see the stud fitting doing double duty to also hold our CO detector in place. Both of the organizers work really well. The cheaper version with the larger pockets is probably the most useful, but it does stick out from the wall more. We were worried that it might flap around as we drive along because it’s only attached at the top corners, but that doesn’t happen. Neither organizer is particularly well made. They will probably collapse at some point, but it was cheaper to buy these and experiment with them than to make our own. If we do make our own later on, we’ll know exactly what features to design in to it. Adding the grommets was pretty easy. If you’re doing the same thing just make sure you hammer them in place on a concrete floor. 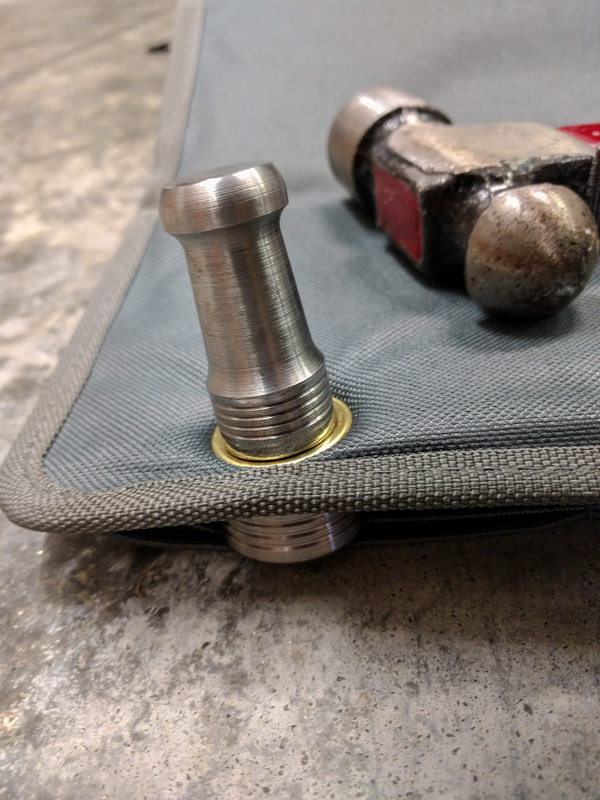 Punching a grommet into the organizer. The tool is included with the pack of grommets. Using the punch and die on a wooden bench didn’t work as well because the bench absorbed some of the blow. Putting the die on the concrete floor in our garage worked much better. 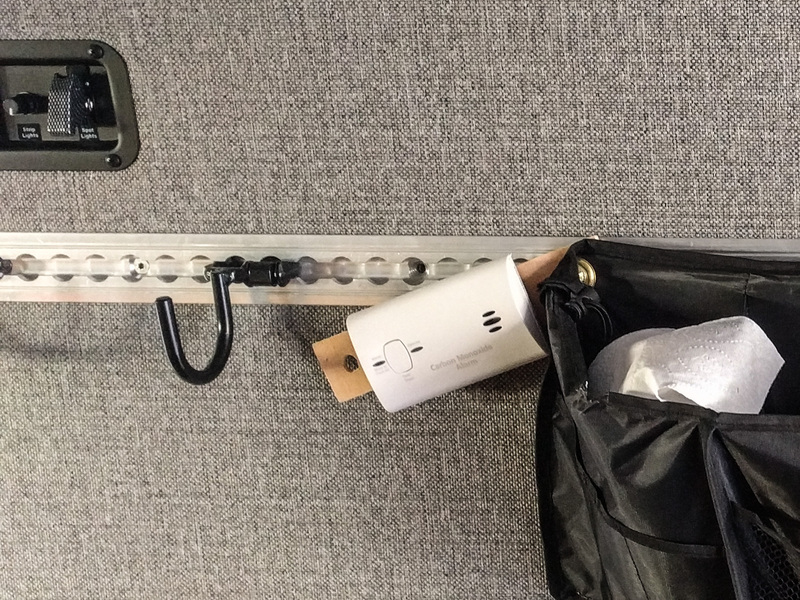 We also bought some J-hooks that clip in to the l-track. These are great for hanging coats on, but they’re also wonderful at bed time. Rather than throwing clothes on the bench seat, we can now hang them up. It makes it much easier to find them (in the right order!) in the morning or in the middle of the night if you need to sneak out for a pee.